(Nanowerk News) In the fight against the viruses that invade everyday life, seeing and understanding the battleground is essential. Scientists at the Morgridge Institute for Research at the University of Wisconsin-Madison have, for the first time, imaged molecular structures vital to how a major class of viruses replicates within infected cells. 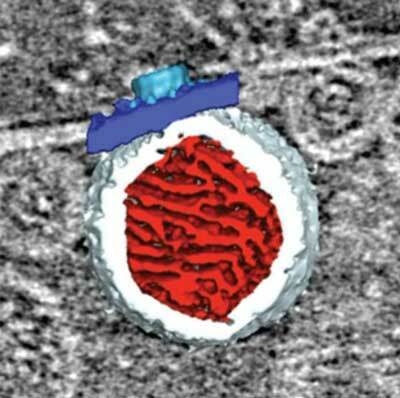 The research, published June 27 in the journal eLife ("Cryo-electron tomography reveals novel features of a viral RNA replication compartment"), uses pioneering cryo-electron tomography to reveal the complex viral replication process in vivid detail, opening up new avenues to potentially disrupt, dismantle or redirect viral machinery. This video shows a three - dimensional rendering of a virus RNA replication spherule from multiple angles. The mitochondrial outer membrane is in dark blue, the spherule membrane in white, the interior spherule RNA density in red, and the spherule crown aperture in light blue.